The New York Medical Angels are willing to provide early-stage funding to companies centered on medical devices, diagnostics, research tools, and drug development. University of Rochester Medical Center researcher Richard P. Phipps, Ph.D., won a top scientific award from the pharmaceutical giant Novo Nordisk, to collaborate on a new obesity therapy based on his laboratory’s discoveries. Phipps, the Wright Family Research Professor of Environmental Medicine, is the first UR faculty to receive the competitive Novo Nordisk Diabetes and Obesity Biologics Science Forum Award. The drug company is providing substantial financial support for the two-year project, which is designed to quickly move basic science in diabetes and obesity to an early stage of drug development known as proof-of-principle. The Center for Emerging and Innovative Sciences (CEIS) works with companies and universities to advance scientific knowledge, stimulate economies, and make cool stuff happen. Read about a few of their exciting current projects at the Democrat & Chronicle or USA Today. Reuters has compiled a list of the 100 most innovative universities on the planet. It is no surprise to anyone that Stanford tops that list. Rochester is proud to be included, too. Read the complete story here. 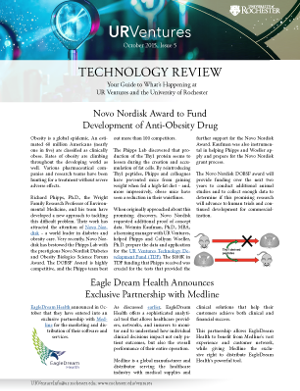 The first issue of UR Ventures Technology Review is out and available here. The 17 June installment of the Good Advice: Case Studies in Clinical Research, Regulation, and the Law will examine the fascinating history of the COX-2 litigation. Presented by M. Kerry O’Banion, MD, PhD and Thomas Jackson, JD and Immediate Past President of the University of Rochester, this session promises to get to the heart of the story. Camber NeuroTherapeutics Inc., founded based on discoveries made in the laboratories of Harris “Handy” A. Gelbard, M.D., Ph.D. and Stephen Dewhurst, Ph.D., plans to attack the cognitive component of neurodegenerative diseases using a completely new approach: stopping the inflammation in the brain, so-called neuroinflammation, that impairs the function of nerve cells and the vast networks they create. These neural networks allow us to store and recall memories, plan and prioritize, focus on particular tasks, and process sensory information. Rochester, NY – May 15, 2015 – EagleDream Health, Inc., a healthcare analytics software solutions company today announced it has acquired Focused Medical Analytics, LLC, (FMA) a company specializing in data analysis to identify, understand, and address clinical variation. The acquisition strengthens EagleDream Health’s analytics solution designed to provide both broad and deep access to clinical, financial, claims and patient generated health data that enables measurement of clinical quality and outlines areas of cost reduction across the health care continuum. Panther Biotechnology, Inc. (OTC PINK: PBYA), a biotechnology company specializing in the development of enhanced therapeutics for the treatment of neoplastic disorders, is pleased to announce today that it has entered into an exclusive global license agreement with the University of Rochester.